On behalf of the over 50 authors who contributed to School Libraries: What’s Now, What’s Next, What’s Yet to Come, we are delighted to announce that our crowdsourced eBook is now available for free download! We hope you will enjoy downloading and reading these diverse perspectives on where school libraries are and what school librarians are doing to redefine, stretch, and expand traditional services. Please feel free to share this link with your colleagues, administrators, professional and union organizations, Board of Education members, and more. Help us spread the word and build the conversation about the possibilities of school libraries! While you can find the eBook on Smashwords now; in about 2-6 weeks, Smashwords will send it out to the major eBookstores (including Apple’s iBookstore, Barnes and Noble, Sony Bookstore, and others, although Amazon is in negotations) for free distribution. PS - Want to create a Smashwords book of your own? 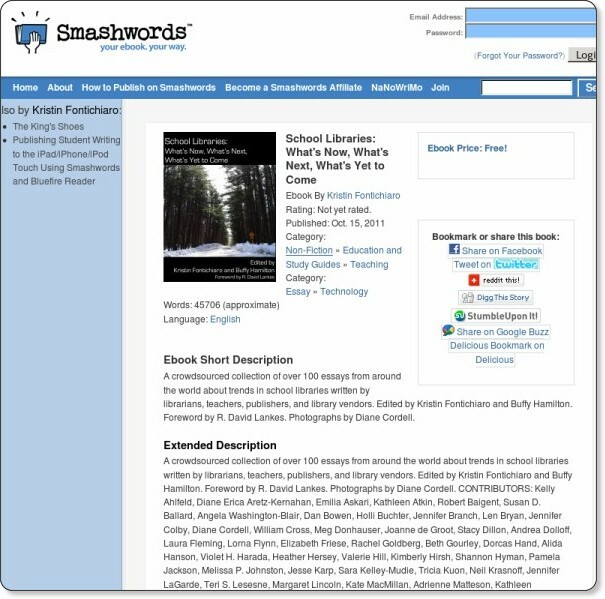 We recommend the Smashwords Style Guide (http://www.smashwords.com/books/view/52). This looks like it would make for a really great FutureofEducation.com interview. Would you and Kristin be up for that?